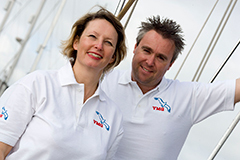 Alex Alley and Paula Reid were core crew on the Global Challenge round-the-world yacht race and own Velocity Made Good – a leadership and performance development business. They recently published their second book: The 7 Racing Rules. In this article we look at Rule #5: Two Watches, One Boat. Two watches: different departments, offices, regions, countries, teams, shifts, projects, etc. One Boat: as in you are all in the same boat (organisation). All in the same boat implies that everyone is experiencing the same general working conditions at the same time and are working towards the same end. People who are all in the same boat must work as a team because they face the same challenges and need to cooperate in order to succeed. The boat (organisation) will achieve greater progress if the teams share the effort and share the passion for reaching the destination. Racing a yacht around the world is a 24 hours a day, 7 days a week operation, with no down time. Maintaining this continuous performance is achieved by splitting the crew into watches, usually two. While one watch is on deck racing the boat, the other is below deck resting, and they rotate on a regular basis (typically every four or six hours). Within this system there needs to be a balance of expertise on both watches with each person having a double or opposite number on the other watch, sharing the same tasks. On our boat racing in the Global Challenge – ‘The World’s Toughest Yacht Race’ – we had a two watch system of eight people in each watch with the Skipper (CEO) and Navigator (Senior Strategic Leader) outside the watch system. It was crucial to have a balanced mix of skills, experience and attitudes to maximise the day-to-day performance of the boat consistently – it was a long race. During a watch changeover – five times a day – there was a handover between opposite numbers to inform the upcoming crew about what had been happening, what to expect and to share best practices. This way the oncoming watch was up to speed much more quickly and therefore performance continued at a higher rate without faltering. (Rule #1: Best for Boat). From a safety point of view it was also important to let the new watch (new shift) know the situation they were picking up and what weather (local conditions) to expect in the near future. There should be no surprises for the joining crew (who were asleep less than 30 minutes before coming on deck). At one point during the race, in an attempt to improve the overall performance, it was decided to have a competition to see which watch could sail the most miles over a number of days. The intention was for each watch to push as hard as they could for the sake of the one boat. However, the idea backfired. Each watch, comprising very competitive people, started to keep information, communication and motivation to themselves, rather than share it with the other watch. So rather than having two teams working together for the greater good, we ended up with two watches competing against each other to the detriment of each other and ultimately the entire team. Very quickly this practice was scrapped as we were all in the same boat, working towards the same goal. It was important that each watch shared information and best practice with their opposite number in order to maximise the performance of the whole team. At the end of the day we were not competing amongst ourselves but against the other eleven boats in the fleet, so the better we worked as one team, the better the overall result would be and the more likely we were to beat the competition. Concentrate the effort and focus on everyone working together to beat the external competitors – the other boats (organisations) you are racing against – and eradicate any internal competitiveness such as departmental incentives or silo’d attitudes. So, how do you lead teams so that the different ‘watches’ are working collaboratively towards the progress of the ‘one boat’? Sharing the destination is ultimately about sharing the vision. The vision needs to be compelling, ambitious, aspirational, exciting, inspiring – visionary. Teams should understand exactly what their vision looks like in the long term, why they have it and how it translates tactically and locally. Our vision on the Global Challenge race was to come first. To be on the top step of the winner’s podium at the final awards ceremony in Portsmouth, in front of a standing ovation of the other crews, friends, family, sponsors and press. The vision was colourful, detailed, multi-sensory and motivational. Organisational visions should be equally exciting and compelling, driving and aligning everyone towards a successful future point. 2. Share the mission or raison d’être. We also shared the same mission; the same raison d’être. Ours was ‘to race around the world’ – not to cruise or sail or swim or rally – but race. We were very clear on that point. We existed as a team because we had all signed up to a round-the-world yacht race; our raison d’être was therefore to race and win. This was a very important point when, on Leg 2, we had to decide whether to race or retire after our second medivac. 3. Share the strategy and goals. Organisations also need to share the strategy in order to operate as One Boat. The leadership team or Senior Management Team may have determined the strategy but it still needs to be thoroughly and clearly shared with everyone on the boat to ensure alignment and empowerment. Finally, Two Watches, One Boat requires alignment around the culture and values. Behaviours and attitudes need to be consensual; the values respected, lived and believed in; the culture tacitly understood and adhered to. When values, vision, mission, goals and strategy aren’t shared, then teams/departments become silo’d, perhaps even working against each other to the detriment of the overall performance. When teams get too competitive or incentive systems are unfair, then collaboration takes second place to competition. If there is divisiveness around fundamental principles, such as whether the strategy is about price or quality, then potentially the company divides or people leave to set up their own company – and thus create two boats. See our Top Tips in this month’s newsletter for our 5 Top Collaboration Tips. Proven ways to achieve collaboration between teams to benefit the one organisation. 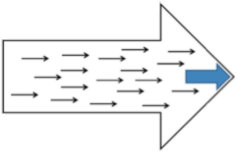 The CEO/MD/Board (represented by the solid blue arrow) is working too far ahead or too far away and is not in touch with the reality of the organisation. They are not close enough to their crew to drive and share direction. They are too far removed to notice or be able to influence the disorder behind them. Aligned leadership team with a clear and visionary direction, shared by management and employees. There are no resisting forces creating friction. Individuals and teams are pulling in the same direction, thus creating momentum and increasing efficiency, speed and effectiveness (maximum Velocity Made Good). The CEO/MD/Board are leading from the front – being visionary and future proofing – but are also visible, accessible and in touch with the crew. Leadership is forward-looking with long-term macro vision, but also close enough to be able to focus on internal detail and productivity. Balancing both is key. Zooming out and zooming in. Your organisation may well consist of different teams, departments, locations, countries, shifts. Prevent them from turning into silos. Work on connecting them; glueing them together into ‘one team / one boat’. Alex Alley and Paula Reid are Directors of Velocity Made Good, a leadership and performance development company based in London. They are both speakers for the Academy for Chief Executives. – www.velocitymadegood.co.uk. Can you tell me where I can purchase ‘The 7 Racing Rule’ as I cannot locate it to purchase? also do you know if it is available in audio book? 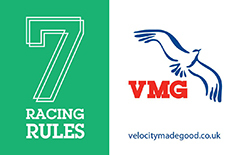 “there has been a slight delay and now the 7 Racing Rules is due to be published in a couple of weeks time. If people want to pre order a copy then if they get in touch direct with us we can sort that out with them, alternatively it will be on Amazon or via our website once it is out. We do have copies of our other book, Boat to Boardroom, if people are interested, again either direct from us through our website or through Amazon.